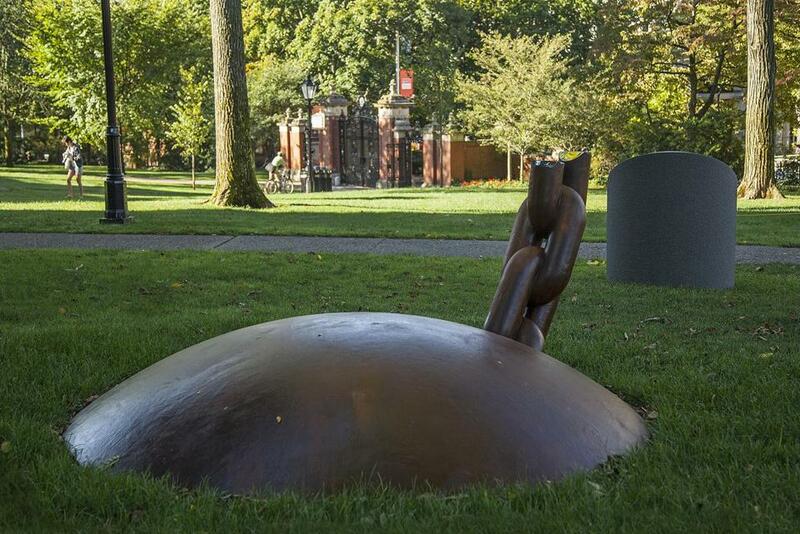 The slavery memorial at Brown University sits near the oldest building on campus. Soon, some of the nation’s brightest students will learn whether or not they have been accepted for early admission at the country’s most elite universities. Few of these young people, however, are aware of how many of these hallowed institutions of higher learning have troubling aspects to their storied history, including Harvard, Yale, and my alma mater, Brown: Each has ties to the trans-Atlantic slave trade. This troubling past, though, is increasingly being unearthed. In 2003, Brown University president Ruth Simmons opened an investigation into the school’s role in the slave trade. The findings exhumed unsettling accounts of the many ways in which important founders of the institution participated in and benefited from slavery, including the use of slave labor to construct the oldest and most iconic building on campus, University Hall. Rather than burying these revelations, university president Christina Paxon dedicated a slavery memorial sculpture that now sits on the campus main green during the school’s 250th anniversary celebrations this September, and, in October, a new Center for the Study of Slavery and Justice was opened. Each of these initiatives stemmed from university officials’ desire to acknowledge and make amends. While Brown’s situation is not remarkable, decades of social psychological research reveal that their proactive investigation and response is. Like most families, colleges and universities rarely want to air dirty laundry, much less do so in such an intentionally public manner. Although reactions from alumni are certain to be mixed, these actions are admirable. Typically, past acts of wrongdoing by members of groups that we are loyal to — such as our collegiate, ethnic, and national ties — are incredibly difficult to stomach. Serious transgressions committed by members of these important groups, even acts from the distant past, challenge our perception that our group is moral, right, and deserving. Consequently, when confronted with acts of wrongdoing, especially those as reprehensible as slavery, we often respond defensively. Rather than accepting responsibility, we deny the events altogether, attempt to justify them, or even blame the victims for their suffering. Recent research from my Social Perception and Communication Lab at Northwestern University, which will be published soon in the journal Group Processes and Intergroup Relations, suggests such defensive reactions are not inevitable. Encouraging individuals to generate redemption narratives — the process of reflecting on past events and considering how they may have led to positive changes or growth in the group — leads individuals to respond to reminders of group transgressions in more pro-social ways. In one of our three studies, for instance, 136 American citizens read a passage about the bombing of Hiroshima during World War II. Some participants were then asked to write a redemption narrative about this event, saying how they thought it may have transformed America and what lessons or insights might have been gained. Others, in a control group, were asked simply to write their reactions to the information presented in the passage. Compared with participants in the control group, those who generated a redemption narrative were less likely to perceive the bombing as justifiable and more likely to offer reparations to descendants of the victims. The results of two other studies with more than 200 American participants were consistent with this finding. What kind of redemption can be found in the wake of such devastation? One theme common among the redemption narratives was the fostering of a new respect for the catastrophic damage associated with nuclear bombs and other weapons of mass destruction. Rather than triggering identity threat, in other words, seeking redemption seems to allow individuals to acknowledge horrific acts committed in the past by members of the very groups that currently serve as a source of pride. According to MIT historian Craig Steven Wilder’s recent book “Ebony and Ivy: Race, Slavery, and the Troubled History of America’s Universities,” many colleges and universities have historical entanglements that are likely to threaten the self-image of its students, alumni, faculty, and staff. Northwestern University and the University of Denver, for example, are currently contending with the reality that the founder of both institutions, John Evans, is culpable for the 1864 Sand Creek Massacre — the slaughter of some 150 Native Americans by federal soldiers in Colorado. Imagine if we all considered what there is to learn from past acts of wrongdoing committed by members of groups that we value, as our research participants and Brown University did, rather than attempting to absolve our threatened identities through denial, rationalization, or victim-blaming. To be clear, generating a redemption narrative is unlikely to be an effective remedy for every violent intergroup conflict or historical instance of mistreatment. And finding redemption in one’s own group’s wrongdoing will not ease the pain and suffering of victims. Given the many unacknowledged instances of past wrongdoing whose legacies continue to shape contemporary relations between groups, however, redemption may provide a foundation to begin the process of reconciliation. Jennifer Richeson is a professor of psychology at Northwestern University.